It means the world to the racers but only in 1/32 scale. 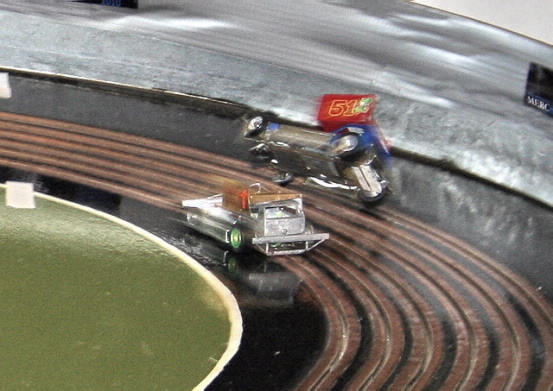 Stock car racing takes place in many forms, levels and costs throughout the world. F1stockcars.com takes a look into the world of slotstox racing and the RMSCC Northern Championship Final. 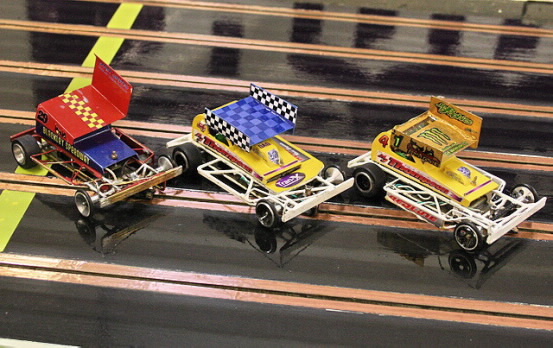 Slotstox racing in the UK has been taking place for nearly 40 years and initially was started by fans stuck for a fix of stock cars during the close season and was run on scalextric tracks. The tracks are now custom built with large chicane hitting zone to try and replicate as much contact as possible. As the sport grew, clubs sprang up all over the country and although the specification of the cars now differs from club to club, the value and respect of wearing the gold roof of a slotstox club is huge within the sport. October 3rd 2010 saw the 35th staging of the RMSCC gold top event in a meeting sponsored by Brisca F1 driver 502 Ricky Wilson through his company www.mercspec.co.uk. Just like the real thing a series of qualifying rounds beginning in January take place before the top 12 scorers are designated into two semi finals. The top three from each semi final then form the grid for the prestigious race for the gold roof. To throw a wild card into the mix, the defending club champion can also take part if he failed to qualify. 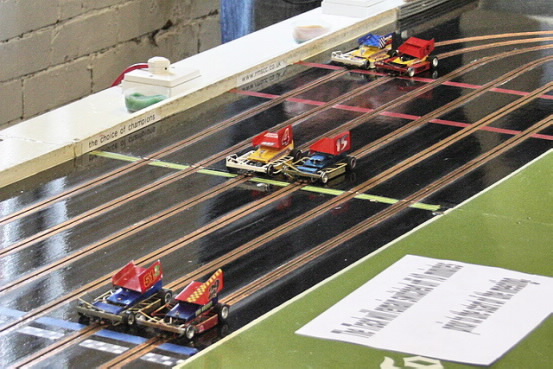 The track the final was raced on at RMSCC HQ in Nelson Lancs. 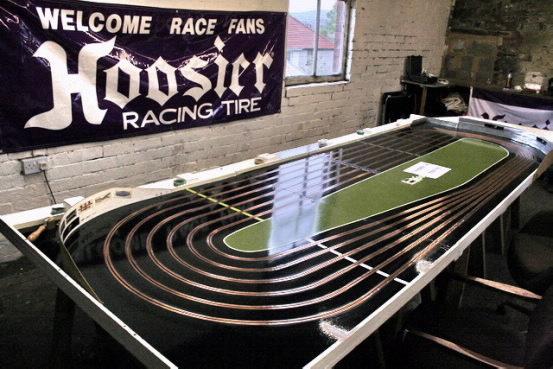 is about 12 feet long by about 4 feet wide and produces some very fast action packed racing on its six lanes. The big race takes place over a series of seventy gruelling six lap races, split into two halves with the grid being reversed at half way. This means every driver has the opportunity to race on each lane ten times over the length of the final and eliminates the advantage of anyone racing all the time on the shorter inner lanes. This years final featured a front row of Dan Rogers #29 and Steve Holgate #51, row two and three featured Brisca F2 racers in the guise of Tony Blackburn #4, Chris Crewe #15, Chris Hodgson #19 and Billy Webster #26.Taking up the challenge from the back of the grid was defending champion Ant Dewhurst #1 who had missed his semi final due to holiday commitments. The racing throughout was fast and furious and when you take into account that the only way you score points is to finish the race, If your car is de-slotted during a race, you do not get put back in, so removing the opposition and staying on the track takes great skill. Points are scored six for a win four for second down to zero if all six cars finish. The extra point for a win is crucial in the final totting up of the scores. At the end of all the racers the driver with the highest number of points scored is declared the winner. 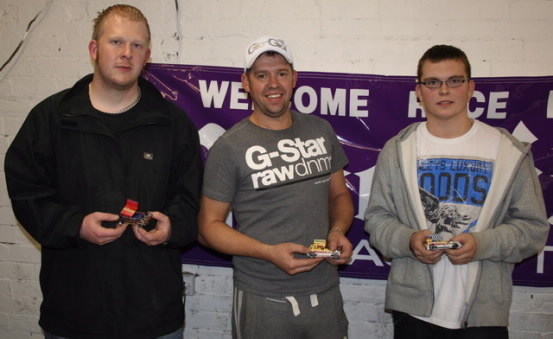 This year’s winner was #4 Tony Blackburn who amassed a grand total of 183 points, second was Billy Webster #26 with 156 points and third just half a point behind was Dan Rogers #29.